in the person who has left as well as in the home that was left behind. Florczyk writes, “We couldn’t wait to finally sieve, sort, and disembody the impurities in our garb” and cleverly evokes change in the shape of a Maytag washing machine, a symbol of the wealthy West and perhaps of a squeaky-clean new life. And yet, change is more complex and more profound in the individuals who adjust to new lives. The line “Still, you stayed up late, calculating how far a heart travels from home with each beat” speaks to the idea that homes are perhaps never entirely left behind and that parts are always taken along on the journey. “Downriver,” the ones that stayed behind become “the rust / racing down the tongue of the slide, / the seesaw weighing the air,” “making baby sounds / with [their] lips / pressed against the fishbowl”; while in the poem “Pastoral,” the speaker, who in a past life “rubbed shoulders with buildings, blue / trams and pigeons,” reminisces on the idea of leaving as an act that resembles “catch-and-releasing” by a brook or a miniscule “breadcrumb,” only to be faced with “silence, something / like a furrow or a dagger” in this version of a pastoral. In contrast to this, Florczyk invites us to share experiences of returning home that are resonant with feelings of nostalgia, uncertainty, and speechlessness. In the poem “Tetris,” the speaker climbs a staircase in a building he once used to inhabit, which skillfully becomes a metaphor for delving further into one’s memories. the antennas to catch somebody else’s dreams. Life was beautiful, I thought, leaving the first floor. To “wear your body like air” gracefully recounts the otherwise difficult to describe sensation of returning to a childhood home after many years. The walnut shell boat and the splintering oars suggest the fragility of such a journey, the complications that might arise when we return to our homes. The desire to look out over the water, to gaze beyond physical borders, and to have the world at our fingertips is not only addressed through the personal narrative of a speaker who has left home to find a different life, but also by means of a perceptive criticism of a society that is constantly on the lookout for new discoveries and ways to conquer the world. In the longer poem “From the Life of Postage Stamps,” Florczyk employs witty metaphors to hold up a mirror to our antics of taking on the world by planes, by climbing towers, or by using computers, just to name a few. A weightlifter suddenly “has a future in Sudan, / carrying pails of water, / should anything here go awry” and “ghosts hook up inside / the royal chamber” while “the guests are reminded / America wasn’t built in an hour.” Florczyk’s facetious and assertive tone when writing “The planets are next” and “If you agree the future looks bleak, / don’t click here” remind us that our actions have consequences. Reading Florczyk’s riveting collection, we find ourselves on a journey from the East to the West and vice versa, all the while being accompanied by Florczyk’s hauntingly beautiful lines that speak of the psychology of borders and exploration, as well as the reconciliation of old homes and new homes. In addition to sharing intimate narratives of moving and settling down, East & West presents us with the dilemma of the 21st century, where the “story of the sun / climbing a fire escape in the rain” is no longer worth telling, but instead quick discoveries are to be made since “Hitting the road—the desert / or the sea—has never / been easier, and that’s a fact.” As a translator of several books of Polish poetry, Florczyk pays attention to the smallest details and has perfected bringing down linguistic borders while also preserving cultural peculiarities. In East & West he allows his readers to step over the crumbling remnants of these borders, to gaze out over the landscape to both sides, and to our astonishment realize that there are no places left to hide. 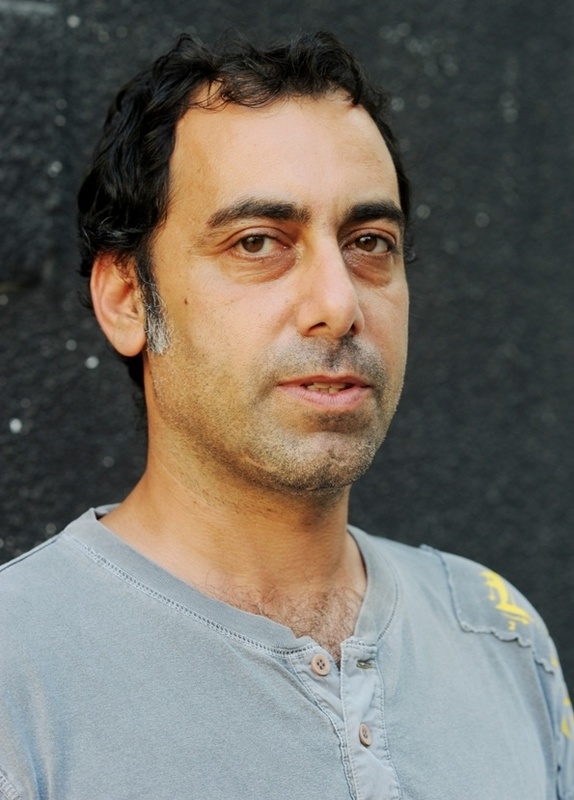 Eli Eliahu, born in 1969, is an Israeli poet based out of Ramat Gan. He has published two highly praised books in Hebrew: I, and not an Angel (2008) and City and Fears (2011). Aside from writing poetry, he writes for Haaretz Daily Newspaper on poetry and culture. Most of his work has not been translated into English, but following our interview with him below, you can read two of his poems, recently translated into English by contributing editors Rachel Gellman and Carly Joy Miller. Rachel Gellman and Carly Joy Miller: Other than poetry, what occupies your time? Eli Eliahu: I work at HaaretzDaily Newspaper as an editor and a writer on subjects of culture and literature. So every day I’m at the editorial board. I have a daughter, she is four years old, and I try to be with her as much as possible. RG&CJM: When did you start writing poetry and why? EE: I started to write poems when I was in elementary school. I was fascinated with books and words from the beginning and once I had the ability to write I tried to recapture the magic of the music created by words and syntax. But it took me a long time to feel that I had my private poetic language and that I could speak through it about my life and not just imitate other poets. RG&CJM: What are your obsessions and how do they come out in your writing? EE: I guess I’m obsessed with words. I like the rhythm, the order of the letters in the words. I am obsessed with the different meanings a word could have in different contexts. I also spend quite some time thinking about the connection between the soul and the body; I think it reflects in my poetry. RG&CJM: What tensions live in your poems? What wakes you up at night to start writing? EE: I think that art in general is based on and is about tensions. Everything that I write is about tensions between two or more things or feelings or thoughts, and poetry is the place that you can put some order to all these contradicting feelings. I also think that the main tension in poetry is between beauty and truth, between the aesthetic and honesty. But what makes me wake up at night to write is usually not an idea or a thought, but a combination of words that appears in my mind that demands to be developed. RG&CJM: How does living in Israel inform and shape your poetry? EE: This is a very complicated question. Almost as complicated as this country. One of the main shaping experiences of an Israeli man is the military service, especially to serve in the occupied territories. There are some poems of mine that deal directly with this experience. But more than that, I think Israel is a very stressed, crowded, violent and noisy country. And this is the background of my poetry. I think part of my poetry is a documentation of the struggle of the individual against this background. I also live in a city, and the city with its buildings, roads, sidewalks, stairs, windows, is the background view of my poetry and a main source of metaphors and images. RG&CJM: Who are your poetic influences? Whose books do you read over and over? EE: First of all there is the Bible. This is the book I read over and over; it has great poetry in it. Maybe the best poetry written in Hebrew. And then there are many poets who have influenced me in different ways. Some of them influenced me with the subject of their poetry, some with their specific and unique vocabularies and others with the music of their poetry. To list some names – Amir Gilboa, Avot Yeshuron, Nathan Zach, Bialik, Alterman, Dalia Rabikovich, Itzhak Laor and others. I also read English poetry. I’m very fond of the poetry of Eliot, Yeats, Ted Hughes, Billy Collins, Carl Sandburg, and above all Walt Whitman. I also read translated poetry. We have great translators of Polish poetry in Israel. I like the poetry of Szymborska and Milosz. They had a great influence on my poetry. RG&CJM: What would you call your poetic aesthetic? EE: I think that poetry is the combination of beauty, wisdom, and music. I try to combine these in my poetry. I think a poet should not only pay attention to the meaning of the word, but also to its rhythm, music, to the associations it brings, and to its connections with the other words that it follows. Above all, poems must have inner music, even if the poem is not written in a structural way. RG&CJM: What do you love about the Hebrew language? EE: I love that Hebrew has an ancient background, and that there have been different kinds of Hebrew throughout the years. I like the fact that in Hebrew different words come from mutual roots. One gets a feeling that there is always a strong connection between things in the world. Hebrew also has an ability to say much in few words. The Bible does this in the most distinct way. RG&CJM: Do you translate any work into Hebrew? EE: Yes, sometimes. I am not consistent with it, but once in awhile I discover a poem that I like so much that I want to read it also in Hebrew, so I translate first of all for myself. It must be a poem that I feel could also stand in Hebrew. There are poems that I like very much, but I feel that most of their power and beauty will be lost in translation. Up until now, I have translated Eliot’s “The Love Song of J. Alfred Prufrock,” and some poems by Billy Collins, Walt Whitman and Philip Larkin. RG&CJM: In the poems we’ve translated of yours, we’ve noticed the themes of family and your home life—do these subjects come up often in your work? EE: Yes. Since the beginning of my poetry I have been trying to find the right poetics in order to be able to talk about my life and my experiences, because, for me, this is one of the main differences between modern poetry/prose and philosophy. In philosophy, you begin with a big idea and then go to the individual, and in modern poetry you go from the individual experience to the big idea. I am also fascinated with the gap between the things that are on the surface and the things that lie beneath, between what is exposed and what is hidden. The place that this gap is most protrusive is within the family, because it is the most intimate place, and still, many things are happening under the surface. will also be a chapter in the learning books. someone will ask to be excused. so-and-so, square by square, they said. the books, they foreclosed one line and went away.